About 30% of all types of shoulder pain is due to impingement and unfortunately of this group, over half of patients report symptoms continuing after 3 years. Getting the right diagnosis and management of this condition is therefore important. The condition can be managed both surgically and conservatively (without surgery), and nowadays the conservative option is used more and more, as it has been shown to be more effective long term in many cases. The shoulder is a ball and socket joint, but the ball (head of the humerus) is far larger than the socket (Glenoid fossa). The roof of the joint is formed by a strong ligament together with two bone struts (the coracoacromial ligament together with the coracoid process and acromion processes). The area below the joint roof is called the subacromial space which contains three important structures, the tendon of the Supraspinatus muscle, a fluid filled sac (subacromial bursa) and one of the bicep muscle tendons (long head). Shoulder impingement (officially called subacromial impingement syndrome or ‘SAIS’) occurs when the tissues within the subacromial space generate pain or are compressed. The compression may be either intrinsic due to changes in the structures within the subacromial space, or extrinsic resulting from external factors affecting the structures. During shoulder movement the subacromial space may reduce, because of the shape of the moving bones and the pull of the controlling muscles. When you look in a mirror, you can see your shoulder and arm muscles easily enough. These large muscles on the chest (Pectorals), shoulder (Deltoid) and armpit (Latissimus dorsi) and clearly visible because they are superficial. However, strip these muscles away (fig) and beneath you will see a second layer of muscles known collectively as the rotator cuff. These muscles control the position of the ball of the joint in its socket as the arm moves. They do this using subtle adjustments of the moving bones to align the parts correctly at each stage of the action. When this complex symphony of muscle actions breaks down however, the position of one bone relative to the other changes, the subacromial space can reduce or tissue can be overloaded, and SAIS may occur. You feel what is known in medical terminology as a ‘painful arc’. As you lift your arm it begins to hurt, but eventually the pain goes away if you lift higher, only to come back as your arm lowers. The rotator cuff muscles should work to help keep the ball of the joint in the centre of the socket, but if they work incorrectly the ball and socket can become misaligned during movement. Typically, this allows the head of the joint to move forwards and upwards (antero-superior) reducing the size of the subacromial space and increasing the likelihood of impingement symptoms. Where this situation has existed for some time, the back (postero-inferior) portion of the joint capsule (bag which surrounds the joint) begins to tighten to try to restrict the forward movement of the ball on the socket. This takes some loading off the irritable structures at the front of the joint, but is only a temporary solution, because the tight capsule restricts inward rotation of the joint. The official name for this feature is GIRD – standing for glenohumeral internal rotation deficit, and normally develops as a consequence of tight posterior structures (capsule and muscles) in general. GIRD is usually assessed in the clinic in the 90-90 position, that is with the arm at 90° to the body and the elbow bent to 90° – often referred to as the scarecrow sign. From this position the forearm is moved forwards (from vertical towards horizontal) and the amount of movement compared between sides. Often there is as much as 25° less movement on the affected side (fig). Tight posterior structures may be stretched using two actions, the cross-body stretch, and the sleeper stretch. The cross body stretch lengthens the posteriorly structures by pressing the arm across the body (horizontal adduction), while the sleeper stretch uses internal rotation and keeps the shoulder blade firm (scapular stabilisation) by having the subject lie on the affected arm. These stretches shoulder only be performed in parallel with a shoulder strengthening programme to help make the joint more stable. 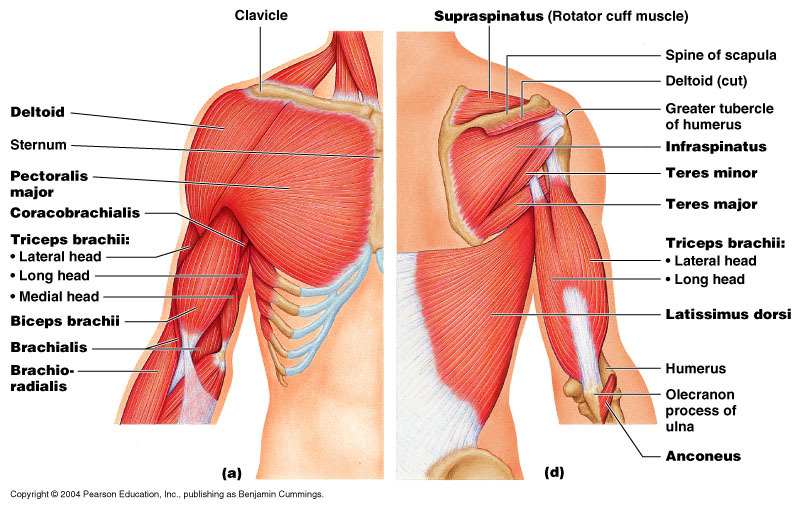 The two most common structures affected during impingement are the long head of the biceps (one of the two attachments of the arm muscle into the shoulder) and the tendon of the supraspinatus muscle which threads through from the back of the shoulder (lying on top of the shoulder blade) to the front. As it does this it passes beneath the roof of the joint (acromion) to attach to the top of the arm bone (greater tubercle of the humerus). It used to be thought that the main cause of the problem was trapping of the tissue between the humerus and acromion (hence the term impingement), but nowadays it is generally considered that there is an altered loading of the tissue which then responds by thickening and changing its nature – a term called tendinopathy. This effect occurs in various part of the body (patella, Achilles, hip for example) as a result in changes to the way the body tissues are loaded. Small amounts of damage (microtrauma) build up over time causing an alteration in the healing response of the tissue. Although this change in understanding of the condition (pathology) does not alter what the patients feels (it’s still painful!) it does change management. Surgery to shave some of the acromion away believing that it was pressing on the painful structure was once commonly done. Modern approaches use this type of surgery far less often, preferring to use non-surgical (conservative) approaches first. Surgery may still be required if the condition is due to an accident (trauma) or a dramatic change in shape of the joint which may have occurred due to a previous injury. The most effective treatment is to alter the loading on the affected tissue and then to gradually strengthen the whole of the shoulder in positions which relieve the impingement, and to do this a structured rehabilitation programme is used. Initially, when the shoulder is painful and irritable (stirred up easily) the aim is to reduce pain and protect the joint. Rest from actions which cause a flare up may be required together with support such as taping and pain relief from treatment modalities such as medial acupuncture. Its important to realise that whilst pain can be a sign of tissue being overused, or it can also be the body over-reacting due to the memory of injury. Exercise is key to re-setting the bodies ability to distinguish between simple aching and potential damage (hurt and harm). As the shoulder starts to recover, a progressive rehabilitation programme is started. This means exercises tailored at helping the condition rather than sports performance for example, and changing the type and pace of exercise as things improve. Several things are important because the movement of the shoulder blade over the ribcage and the action of the ball and socket of the shoulder all make the region quite complex. Firstly, some exercises which tighten muscle without moving the joint (isometrics) can be used throughout the day to ease pain, and if the joint is also stiff gentle arm swinging exercise with the muscle relaxed (pendular exercise) can have a soothing effect on the painful area (photo). Isometrics are performed by pressing the hand against a wall. The least painful position of the joint (the one which provides the maximum sub-acromial space) is with the arm slightly out from the side of the body (abduction) and slightly forwards in line with the angulation that the shoulder blade as it rests on the ribcage. This ‘safe’ position is called scaption (combining the words scapula and abduction) and should be combined with external rotation of the joint (thumb facing the ceiling not the floor). Actions such as pressing the back of the forearm against the wall with the arm at the side of the body, elbow bent to 90° (fig a) and combining this with forwards and outwards (flexion-abduction) (fig b) are useful starting positions for isometrics. Play around with different positions until you find one which works for you. Press the arm into the wall for 20-30 seconds (about 5-6 breaths) and then release. For the pendular exercise, lean forwards with your unaffected arm supporting your bodyweight. Allow you affected arm to hang relaxed, and slowly start to circle it from the shoulder keeping your arm straight. Once moving, keep the arm moving using just your body sway to avoid the shoulder muscles working too hard, as the aim with this movement is to relax them. Exercises to strengthen the muscle connection between the shoulder blade and ribcage (scapular stability) are important and these muscles form a firm base for the arm to move upon. Establishing this firm foundation is vital as we build up to harder exercises later. Stability exercise of this type can be done with the hand on a wall or the floor in a press up position. Techniques using this type of action is termed ‘closed chain’ and actions where the hand is free to move (throwing for example) are ‘open chain’. We can begin in a kneeling position, taking the bodyweight over the hand and pressing into the floor (imagine making your arm longer). Hooking a resistance band around your wrists increasing the effect of the exercise by pressing the arm forwards and outwards (flexion-abduction) as you take weight through the arm. Wall press-ups and press-up positions on the floor can also be used to walk the hands forwards and backwards in each case aiming to feel the arm lengthening to fix the shoulder blade to the ribcage and avoid ‘shrugging’ or ‘winging’ positions. We now progress to arm movements using our stable base as a foundation and ensuring optimal movement positioning. The focus on scaption (45° to the body plane) and external rotation (thumb up) continues, but we gradually introduce other movements of the shoulder and of the whole body to get the arm working as it would in normal day to day actions (functional movement). Resistance bands can be useful for these actions at home, and weight training is great to strengthen the shoulder muscles. Don’t think of weights just being for bodybuilders. You won’t get big muscles, just a strong pain free shoulder. 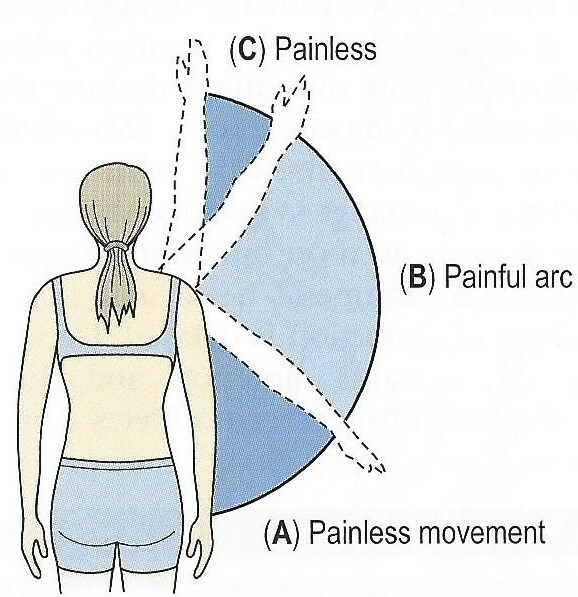 If lifting your arm causes pain still, a technique called mobilisation with movement (MWM) can help. We saw that impingement pain can occur if the ball of the shoulder socket moves up and forwards because the muscles which perform the opposite action (down and back) may not be working correctly. They may be weak, or not working at the correct point in the movement (timing problem). With MWM, your physiotherapist uses their hands or a belt to draw the ball of your joint down and back slightly as you move your arm overhead. If this action reduces pain, you can use it as a home exercise by getting a family member to help or using a narrow belt (yoga belt) or resistance tube looped around your shoulder and tying the end to a door handle or piece of furniture. Resistance bands can also be used to further strengthen the arm, again focussing on lateral rotation and scaption actions as they are less likely to cause pain. The Pilates dumb waiter and Y exercise are good choices. For the dumb waiter take the ends of a resistance band in each hand (wrap around the hand so the band does not slip) and bend your elbows keeping them tucked in to your sides. The action is to twist the arm from the shoulder, so your forearms travel in a horizontal semi-circle (lateral rotation at the shoulder). Control the action and do not allow the band to ‘snap back’ as you draw your hands together again. For the Y exercise stand with your back towards a wall, and again wind a resistance band around your hands / forearms. Take up the 90:90 position at the shoulders and elbows and then lift your hands up straightening your arms and pressing out against the band so your hands move apart slightly (Y shaped action). Again, control the action as you lower back to the start. To make this exercise more challenging, place you back against a gym ball, and lower down into a wall-squat action as you lift your arms. This challenges stability at the shoulders and lumbo-pelvic area simultaneously and work the whole of the back of the body (posterior chain). Up to now, the exercises have been focussed on your shoulder. In daily living however, we perform actions which involve the whole arm and body moving at the same time, with the shoulder acting as just one component of a more complex action. This type of whole body movement which tries to mimic daily living activities is called ‘functional training’ and acts as a final bridge between rehabilitation and returning to work or sport. Lifting, pushing and pulling are all actions which can be done in housework, gardening, manual work, or in the office. As we have seen press-up actions (pushing) can be performed in kneeling and then made harder (progressed) by performing them in a classic lying style or harder still by putting your arms on an uneven surface such as a Bosu in the gym, or by moving into a handstand position. Where kneeling push-ups are too hard they can be made easier (regressed) when performed against a wall. Pulling action can be done in the gym using a suspension trainer (TRX), or simply by looping a belt or towel around the bar of a bannister at home. Lifting actions are easily performed in a gym using dumbbells, barbells, and kettlebells. At home any weight will do (brick, stool, small child!). Actions such as shoulder press (lift above shoulder level) are useful as they rehearse using the whole of the arm with the rest of the body. The key to exercise therapy is that it must be progressive (get harder as you get stronger) and match your individual requirements (specificity).